Yesterday we showed you an interesting modification to the lock screen, with QuickShoot can take a picture by double clicking the camera icon , helpful right? Today we bring something less useful but very nice. Taking the idea of iTunes 11 the amended ColorLock tweak your lock screen colors to adapt to the photo album that falls into the song that is playing at the time. The bar at the time and unlock slider will be colored in the same colors as the picture show the album art. The truth is that in the pictures above looks great, but to be seen as it does, it can consume enough resources or memory if you do go. No icons or settings brings, so to turn it off you have to go to Cydia and desinsinstalarlo completely. Also has no support for Spotify or other external. Not yet available and who tried it say it fails pretty, not color bars most of the time, only when the colors are very clear. So we will wait for the developer launch it, see how it works and decide whether to install it or not. Course is nice. You can download it from Cydia, still do not know the price they will. You need to have done the jailbreak on your device. 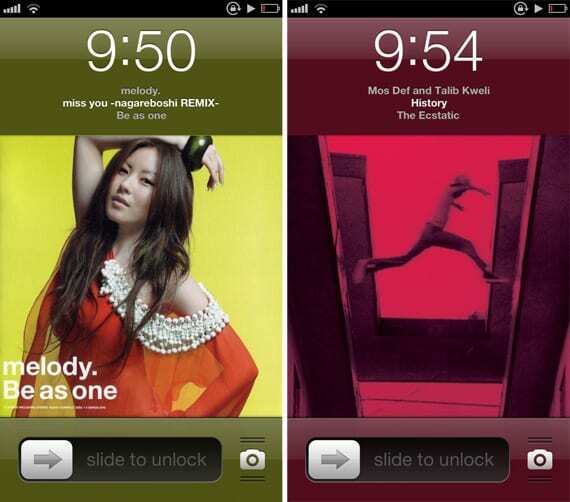 Article ColorLock: lock screen colors depending on the music play (Cydia) was originally published in News iPhone .